When Jamaica Wild, an agent with the Bureau of Land Management in New Mexico, hears that buffalo on the Tanoah Pueblo are wandering out of their enclosures, it’s her job to investigate. When she arrives, she finds Jerome Santana, standing in the midst of the herd, clad in traditional apron over his jeans, arms outstretched, eyes fixed on Sacred Mountain with a strange kind of joy. He wears the same look on his face as he starts the stampede that kills him. Jamaica is stunned. Was it some form of ritualistic (and very uncertain) suicide? Was he high? The Tribal Police, who have authority over such things on the pueblo, clearly can’t get rid of her fast enough. In fact, they seem a lot more worried about her leaving than the man who just died. Outsiders are not allowed on the pueblo during Quiet Time, the holy days before the pilgrimage to Sacred Mountain, so the investigation is over before it begins. Jamaica’s mentor and medicine teacher on the pueblo, Momma Anna, imparts ancient wisdom, but as a family member of Jerome, her loyalties are divided. When others go missing, Jamaica knows she’s not going to be able to leave this alone. 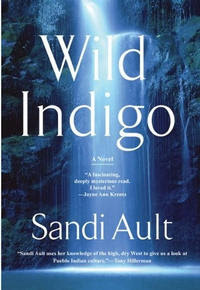 WILD INDIGO is an astonishingly assured debut novel. The author carefully notes that she’s blended the cultures and traditions of several peoples for purposes of the story, and the result is magic. There will be inevitable comparisons to Hillerman, and, for my money, Ms. Ault is more than up to the task. The novel includes mystery, mysticism, native traditions, action, and some fascinating information about raising a wolf cub. Having raised one, the author clearly knows whereof she speaks, and Mountain the wolf is an integral character. I’m looking forward to the further adventures of Jamaica and Mountain.